We have been wanting to write this testimonial for a long time. We both would like to thank Jay, and his whole team for all of their efforts in capturing our memories that we will treasure for a lifetime. From the pre- wedding shoot, to the wedding a few months later, Jay showed great professionalism throughout, always giving us the time to answer questions, which made us feel very comfortable. After meeting Jay and speaking to him several times, we really understood how passionate he is about his craft. This really gave us confidence in his ability, and we knew we would be fine and taken care off on the day. We were really impressed and grateful for all of Jay’s hard work in putting in the time before, during and after our wedding. Jay really listened to our ideas and wishes, and also gave his expertise when needed to produce what we believe is a great end product. The blue ray was excellent quality, and the wedding photos were captured beautifully. We would recommend Jay to any couple getting married in the future. His personal approach to his clients is what makes him different to other photographers, along with his talent, experience, passion and friendliness. We couldn’t thank Jay and his team enough! Where do I start with Jay and his team.. they have been fantastic from start to finish! Firstly the pre-shoot - Hinesh and I are not very photoshooty people but Jay put us at ease instantly - laughing and joking with us to make it less awkward! He managed to capture our personality in our guestbook perfectly! Secondly, the build up to the wedding Jay always replied to emails efficiently. This for me was a bonus - anyone planning a wedding knows how stressful it is when people don't respond - this was not a concern I had with Jay. Thirdly, on the day of the wedding and reception Jay and his team captured all the details superbly and they have now been beautifully presented in our album and on our Blu-rays. Finally, Jay worked tirelessly to perfect our Blu-rays and album. He ensured everything was exactly how we wanted it whilst giving his expert advise. The end products have been continually praised! I cannot recommend Jay and his team enough. They are artists - their work speaks for itself! Thank you all for capturing and preserving the memories of our special day! 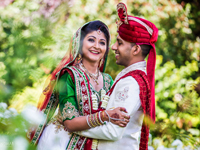 We specialised in Gujarati, Sikh, Hindu Panjabi, Islamic and English Wedding Photography and Cinematography. Also specialised in Commercial Photography and Video, Corporate Headshots, Business Advert Video. Contact us to discuss more about your photo & video requirements, We would love to hear from you. Give us a call.